On Wednesday evening, a homemade bomb placed in a locker at the supermarket in northwestern Saint Petersburg, Russia's second city and Putin's hometown, went off sowing panic among customers and wounding 14 people including a pregnant woman. Vladimir Putin warned that armed criminals could be "liquidated on the spot." 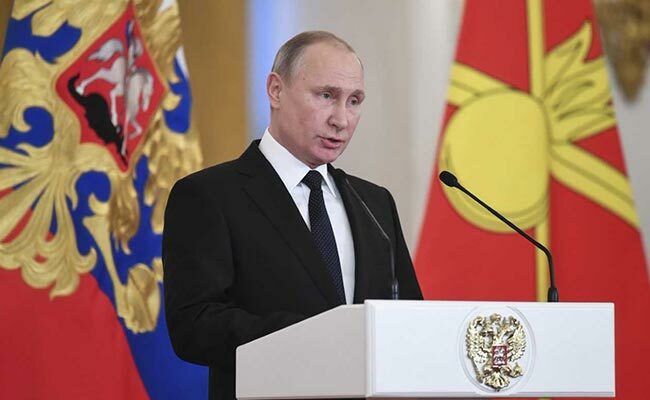 Moscow, Russia: Russian President Vladimir Putin warned Thursday that armed criminals could be "liquidated on the spot," calling the blast that tore through a Saint Petersburg supermarket and wounded 14 people an "act of terror." "As you know, an act of terror took place in Saint Petersburg yesterday," Putin said on Thursday, speaking at a ceremony to award officers who took part in Russia's Syria campaign. He said he had ordered the nation's security services to "act decisively" and "liquidate bandits on the spot" if armed militants put up resistance. His spokesman Dmitry Peskov told reporters later that the Russian leader was referring to all those "who harbour plans to carry out acts of terror in our country." Citing the latest count, officials said a total of 14 people had been wounded in the blast. Six people remained in hospital, they added, noting the wounded would receive financial aid. The bombing came after the FSB security service said earlier this month it had prevented a terror attack on a key Orthodox cathedral in Saint Petersburg with the help of America's CIA, which led Putin to thank US President Donald Trump. The explosion occurred at around 6:45 pm (1545 GMT) as people geared up to celebrate the New Year -- the country's biggest holiday -- followed by Russian Orthodox Christmas, which falls on January 7. Officials said the bomb had power equivalent to 200 grammes of TNT. The investigation was being overseen by Russia's National Anti-Terror Committee even though authorities initially opened a probe into attempted murder. The committee said the explosion went off after "a criminal placed an unidentified explosive device in a storage locker." Footage posted online by local media showed a man in a green hooded sweatshirt enter the supermarket with a backpack and leave without it a short time afterwards. An important cultural venue, Saint Petersburg is also home to tens of thousands of migrants many of whom come from majority-Muslim Central Asia. Putin's spokesman Peskov rejected concerns that Saint Petersburg had become especially vulnerable in the face of terrorism. "Terrorism presents a danger to any populated locality in the world," he told reporters. He added that Putin -- widely expected to extend his Kremlin term to 2024 in a March presidential election -- had every intention to "continue consistent and task-oriented work to fight terrorism." "The fight is continuing," he added. In April, a suicide bombing killed 15 people and wounded dozens on the Saint Petersburg metro. That bombing was carried out by a national of Kyrgyzstan and claimed by a group linked to Al-Qaeda which said it was a message to countries engaged in war with Muslims, a reference to Russia's military campaign in Syria. Earlier this month the FSB said it had arrested several IS members who had planned to blow up the Kazan Cathedral, one of Saint Petersburg's most famous landmarks, among other busy places. Authorities have confiscated a large number of explosives used to make homemade bombs, automatic rifles, munitions and extremist literature. Earlier this month Bortnikov said that at least 4,500 Russians had left the country to fight with "terrorists" in the Middle East, North Africa and other regions.